Introduction: Analysis of the generation, ascent, and eruption of magma on the Earth and planets provides substantial information about the geological history and thermal evolution of each body. 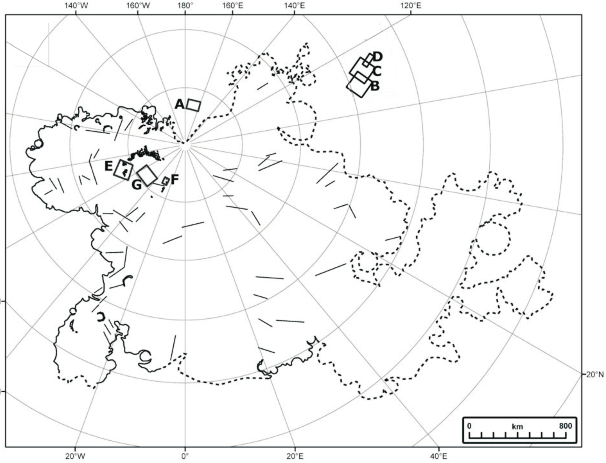 Here we synthesize the array of extrusive features and landforms (Figure 1) seen on the terrestrial planets (e.g., Wilson and Head, 1983; Wilson, 2009) and compare these to those that have been observed to date on Mercury by the Mariner 10 and MESSENGER spacecrafts (e.g., Strom et al., 1975; Spudis and Guest, 1988; Robinson et al., 2008; Wilson and Head 2008; Head et al., 2007, 2009a,b, 2011). We then explore how these features provide insight into eruption styles, lithospheric stress states, and mantle convection on Mercury. Finally, we assess how these conditions might explain the very widespread flood lava-like province observed in the north polar region of Mercury. Figure 1. Typical volcanic features on the terrestrial planets. 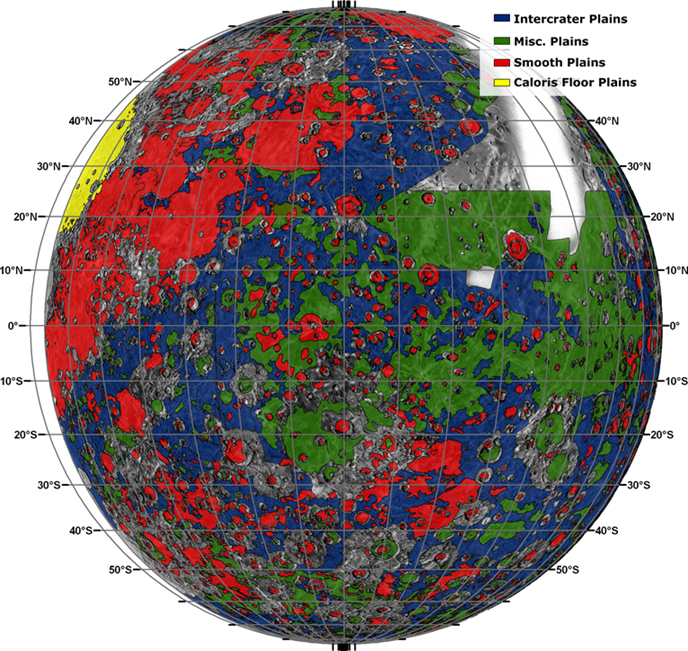 Volcanic Features and Styles on the Terrestrial Planets: Surface elemental compositions of the terrestrial planets are consistent with a range of mantle compositions, but all are likely to produce mafic to ultramafic melts. The main controls on the types of surface volcanic features and accumulations are thus expected to be differences in 1) magma viscosities and volatile contents, 2) tectonic regimes, 3) crustal densities, 4) crust and lithosphere thicknesses, and 5) mantle convective style. Preferred locations for magma reservoirs appear to be either at significant depth within a planetary interior or relatively shallow within a volcanic edifice. Deeper reservoirs can form near the rheological change at the base of the lithosphere, at upwellings due to pressure-release melting, or at vertical discontinuities in density such as at the base of the crust. Evidence for shallow reservoirs in edifices is seen in calderas. Evidence for deeper magma bodies is seen in giant dike swarms (Ernst et al., 1995). The position of ascending mantle flow is often marked by broad rises formed from thermal uplift, enhanced crustal construction, and individual edifices built by surface eruptions (e.g., Iceland and Hawai'i on Earth, Tharsis on Mars, Beta Regio on Venus). On Venus, volcanic complexes and rises are often accompanied by large annular deformational features (coronae) produced by some combination of uplift and accommodation of intrusive and extrusive loads (Figure 1). Shallow magma reservoirs are commonly formed within volcanic edifices on Earth, Mars, and Venus. Building a volcanic edifice and reservoir requires multiple pulses of magma to rise frequently within a spatially restricted region over an extended period of time (Parfitt et al., 1993). On the Moon, in contrast, low eruption frequencies and great flow lengths ensure that typical large edifices will not form (e.g., Head and Wilson 1991). Shallow reservoirs form within edifices at levels of neutral buoyancy. Repeated, relatively small-volume eruptions from these shallow reservoirs (Figure 2) progressively build shield volcanoes of a range of sizes and aspect ratios on Earth, Mars, and Venus. These shield volcanoes commonly host collapse calderas at their summits, produced when substantial volumes of magma are erupted on the volcano flanks (Figure 1). Figure 2. Modes of ascent and eruption of magma and the different manifestations of narrow compared to wide dikes (Wilson and Head, 2012). Deeper magma reservoirs have certainly existed on Earth, Venus, and Mars. Giant dike swarms can be recognized by eroded outcrops (Earth and Mars) (Head et al., 2006), the radial patterns of volcanic vents that they feed (Venus) (Ernst et al., 2003), and/or the graben formation that they cause (Venus and Mars) (Ernst et al., 2001; Wilson and Head, 2002). These giant dikes are close analogs to the large dikes that fed magma to the surface of the Moon from near the base of its crust (Head and Wilson, 1992a). When mantle magma rises to a density step at the crust-mantle boundary, a stress regime characterized by net horizontal extension will favor upward propagation of dikes, whereas horizontal compression will favor initial sill formation. Evidence for volcanism from surface features on Mercury: On the basis of Mariner 10 (Strom et al., 1975; Spudis and Guest, 1988; Head et al., 2000, 2007; Wilson and Head, 2008), MESSENGER flyby data (Murchie et al., 2008; Strom et al., 2008; Head et al., 2009a,b) and initial orbital observations from MESSENGER (Head et al., 2011), we see no evidence for large shield volcanoes on Mercury like those on Earth, Mars, and Venus, and we see only small numbers of low shield-like constructs and candidate calderas, some reminiscent of those on the Moon (Head et al., 2009b). 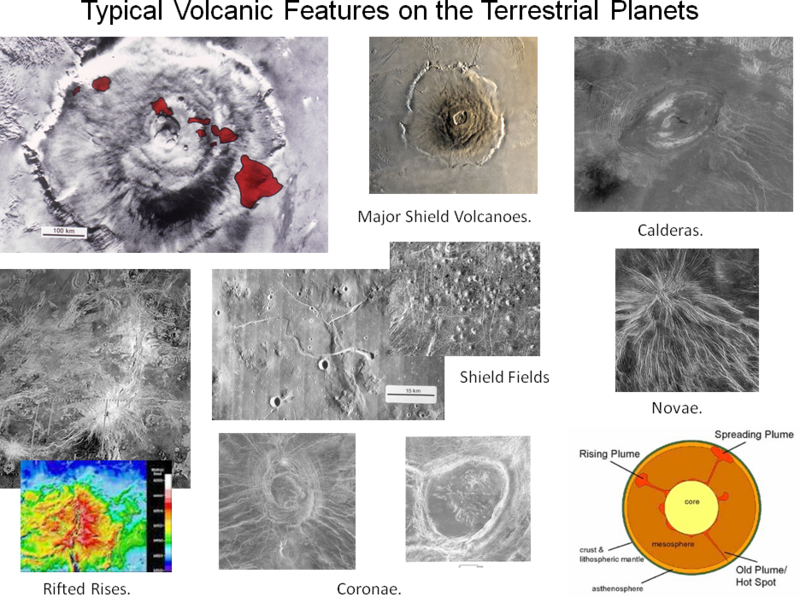 No evidence has been discerned for extensive centers of volcanism as seen on Mars (e.g., Tharsis, Elysium) (Wilson and Head, 1994) or Venus (e.g., Beta and Atla Regiones) (Head and Wilson, 1986, 1992b), or less well-developed ones as seen on the Moon (e.g., Marius and Rumker Hills) (Figure 1). Nor has evidence been seen for any Venus-like corona or related annular deformational features displaying associated volcanism. 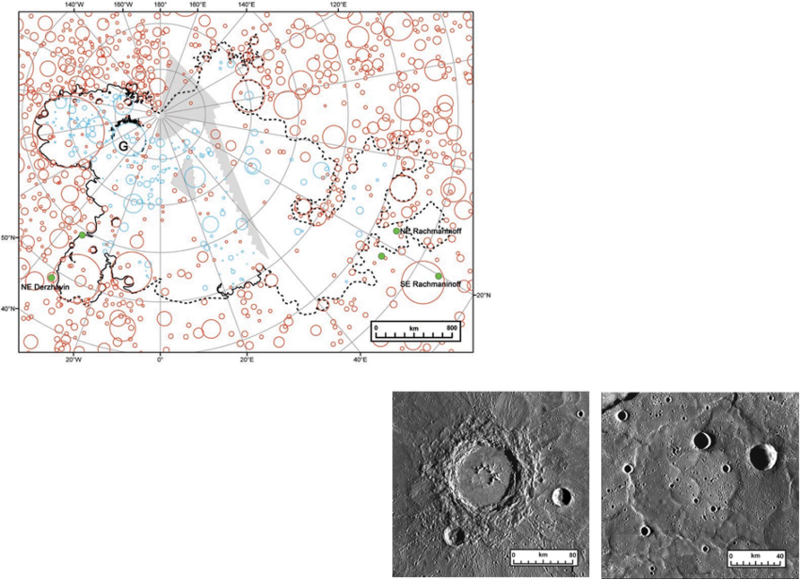 Only one radial graben structure (Pantheon Fossae), centrally located in the Caloris basin, has been documented (Head et al., 2009b). 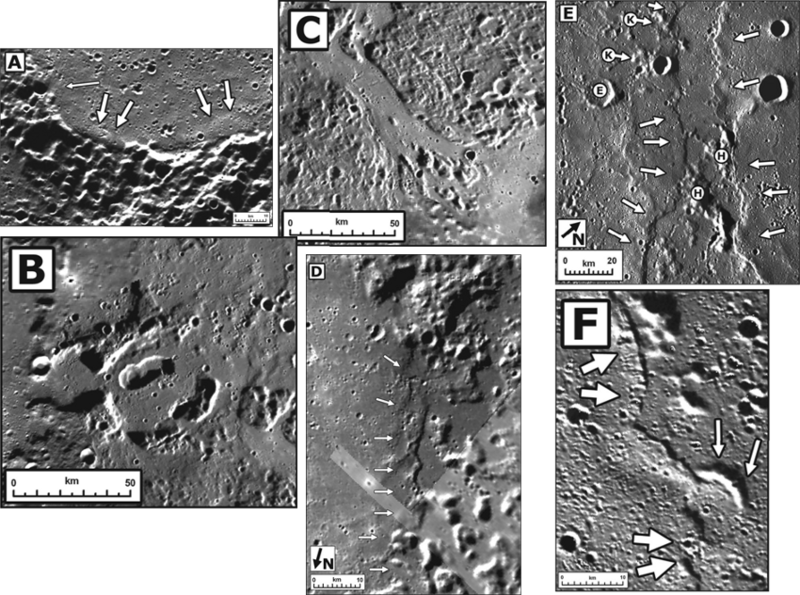 Observations of Mercury to date also reveal no evidence for several types of volcanic features (cones, leveed flows, or sinuous rilles) (Milkovich et al, 2002), although some irregular craters surrounded by pyroclastic deposits are observed (e.g., Kerber et al., 2009, 2011). 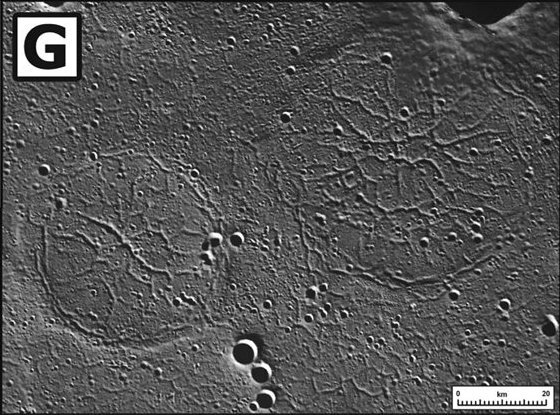 Instead, we see evidence on Mercury for extensive flooding of the surface to form regional smooth plains that appear to be very extensive lava sheet flows, and intercrater plains (found between large, old impact craters) that may also be formed by volcanic eruptions (Strom et al, 1975) (Figure 3). Volcanic plains filling the interior of the Caloris basin show generally uniform ages and spectral characteristics (Strom et al., 2008; Fassett et al., 2009) and are up to several kilometers thick (Ernst et al., 2010). Exterior plains of volcanic origin have similar to slightly younger ages (Strom et al., 2008, 2011; Fassett et al., 2009). Figure 3. Distribution of plains of possible volcanic origin on Mercury (Strom et al., 1975; Spudis and Guest, 1988). The orbital portion of the MESSENGER mission has revealed contiguous plains at northern high latitudes (Figure 3) that cover ~6% of the surface of Mercury, have surface ages and spectral properties that show no resolvable variation, and reveal no specific source regions or associated edifices (Head et al., 2011). Generally the Caloris-related (Murchie et al., 2008; Fassett et al., 2009) and northern volcanic plains (Head et al., 2011) show no signs of broad, rifted rises, constructional landforms (shield volcanoes), or individual linear, leveed flow fronts (Figure 1). Indeed, analysis of the characteristics of the northern plains reveals abundant buried impact craters (blue circles in Figure 5) and assessment of their size distribution, coupled with knowledge of their pristine depth-diameter relationships, suggests that the thickness of lavas in this unit are in excess of several kilometers (Head et al., 2011). The general characteristics of the plains deposits and features on Mercury strongly suggest that they were emplaced by flood-lava-style eruptions (Figure 2) (Wilson and Head, 2008, 2012) rather than collections of narrow, leveed flows typical of small dike-emplacement events and more limited-volume surface eruptions. Figure 4. Distribution of smooth plains deposits in the northern high-latitudes of Mercury and comparison of this area to the Earth and Moon. Figure 5. Craters (red circles) predating and postdating the area of smooth plains (black line); buried craters (blue circles and inset) permit the estimation of the thickness of the lava fill (Head et al., 2011). The characteristics of the northern lowland plains support these interpretations. Margins of flooded craters show evidence of thick inflated flow fronts (Figure 6A), steep lobate flow fronts are observed at the margins of large craters and basins (Figure 6DEF), and smaller flooded impact basins several tens of kilometers in diameter display interior networks of cracks (Figure 6G). Only outside the contiguous plains are apparent source vents observed (Figure 6B); also observed outside the contiguous plains is evidence for very high effusion rate eruptions (terrain sculpted by flowing lava and thermal erosion) (Figure 6C). Figure 6. Features typical of the surface and margins of the northern smooth plains and outside areas (see location map) (from Head et al., 2011). A, inflated flow margins at edge of impact crater; B, candidate source vent; C, landscape apparently scoured by flowing lava; D,E,F, margins of steep-sided flow fronts; G, flooded craters modified by interior cracking. This overview of the range of volcanic and associated tectonic landforms seen on Mercury from Mariner 10 and MESSENGER data indicates little deformational or constructional evidence for localized convective upwelling (Figure 1) (e.g., radially/concentrically deformed structures, volcanic rises/edifice concentrations, coronae) or the presence of local shallow crustal magma reservoirs (e.g., large shields, abundant floor-fractured craters, calderas, narrow channelized flows, aggregation of small volcanic constructs). 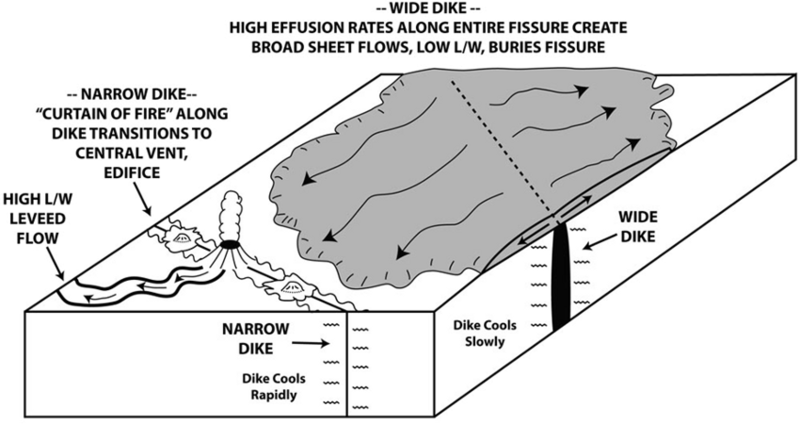 Magma delivery to the surface in the presence of mantle convection occurs as both the host rock and melt rise together in convection cells and encounter more brittle rocks; dikes then transport melt to the surface in the vicinity of a rising mantle diapir (Figure 1). Where convection is suppressed or very broad (e.g., Michel et al., 2012), the process is different; a vertically and laterally extensive melt layer can form beneath a conductively cooled lithosphere and as the amount of partial melting increases, the corresponding increase in the vertical extent of the layer causes an increase in excess pressure at its top. Expansion of the melt layer exerts extensional stresses on the overlying lithosphere, inducing vertical fractures that form dikes through which melt escapes. In such mantles the elastic lithosphere will tend to be thinner and more susceptible to penetrative dike formation than for fully convecting systems, and flood volcanism will be favored. Analysis of magma transport and delivery from depth predicts eruptive fissure widths of ten to several tens of meters and lengths in the 40-90 km range, consistent with flood volcanism (Wilson and Head, 2012). The typical mode of eruption of magma in the flood lava mode has been explored (Head et al., 2009a; Wilson and Head, 2012) for a range of mafic mantle melts. The great lengths of fissures and large dike widths cause broad sheet-flows rather than long, narrow, leveed and channelized lava flows. Lava is released at high volume fluxes from these long, wide fissures to flow downslope in a turbulent manner. A typical flow will be 1.4-1.9 times thicker than comparable flows on Earth, reaching distances of ~300 km in ~20-60 hours. Flow fronts cease to advance not due to cooling but instead due to cessation (or major reduction) of supply at the vent (flows are volume-limited, not cooling-limited). Under these conditions, the vast majority of lava-flow emplacement events will be in the flood lava mode, and lava distribution will vary as a function of global magma generation history and longer-term thermal evolution. Direct eruption from depth will slow and cease as lithospheric horizontal stresses increase. These conclusions hold equally well for both basaltic magma and magma with compositions intermediate between basaltic and komatiitic that may occur on Mercury (Nittler et al, 2011), because the changing stresses exert more influence on the ability of a dike to remain open through the full vertical extent of the lithosphere than on the speed with which magma can flow through the dike. In summary, magmatism on Mercury appears to be characterized predominantly by: 1) deeper magma sources of large volume, 2) minimal shallow crustal storage of magma, 3) vertically extensive and wide dikes penetrating completely through the lithosphere and crust, and 4) high-volume eruption rates of lava and correspondingly voluminous outpourings producing long/wide lava flows covering extensive areas (Wilson and Head, 2008; 2012). In this environment, large volumes of mantle melt are available for eruption, melt is pressurized, and the lithosphere is in a net state of extension. This induces brittle fractures in overlying lithosphere, resulting in wide, long eruptive fissures, with widths many tens of meters and lengths greater than tens of kilometers. Eruptions from these dikes form broad sheet-flows rather than leveed flows. Lava erupts turbulently at very high fluxes and thermal erosion is maximized. Flows may reach 300 km distance in 20-60 hours and the proximal flow drowns topography. Flows are very likely to be volume-limited: they cease advancing due to supply, not cooling. A hallmark of these types of eruptions is that they will bury vents and fissures, and much of the surrounding cratered topography, leading Wilson and Head (2012) to describe this style of volcanism as “Equipotential Surface Flooding”. Possible komatiitic-like compositions on Mercury (e.g. Nittler et al., 2011) will only enhance these factors. These observations are interpreted to mean that the ability of magma to reach the surface on Mercury has been strongly influenced by 1) the broad nature of mantle convection and 2) the lithospheric stress state. The comparatively small vertical extent of Mercury’s mantle (Smith et al., 2012; Michel et al., 2012) may inhibit convection and favor sublithospheric magma buildup and extensional lithospheric stresses on local to regional scales in the planet’s early history. A late-stage tectonic history dominated by horizontally compressive lithospheric stresses could account for the termination of an early period of voluminous volcanic activity. Modeling of the effect of increasing horizontal compressive stress on the ability of dikes to penetrate and remain open through the full thickness of Mercury’s lithosphere of Mercury (Wilson and Head, 2008; 2012) has shown that lithospheric magma transport was suppressed when compressive stresses exceeded critical values in the range of several tens of MPa, similar in magnitude to the stresses thought to form the global system of lobate scarps and other contractional landforms (Watters et al., 2009). Continued exploration of Mercury during the ongoing MESSENGER extended mission and the upcoming BepiColombo mission will investigate these trends further. Ernst, C. M., S. L. Murchie, O. S. Barnouin, M. S. Robinson, B. W. Denevi, D. T. Blewett, J. W. Head III, N. R. Izenberg, S. C. Solomon, and J. H. Roberts (2010) Exposure of spectrally distinct material by impact craters on Mercury: Implications for global stratigraphy, Icarus, 209, 210-223, doi:10.1016/j.icarus.2010.05.022. Ernst, R. E., D. W. Desnoyers, J. W. Head, and E. B. Grosfils (2003) Graben-fissure systems in Guinevere Planitia and Beta Regio (264-312E, 24-60N), Venus, and implications for regional stratigraphy and mantle plumes, Icarus, 164, 282-316. Ernst, R.E., J.W. Head, E. Parfitt, E. Grosfil and L. Wilson (1995) Giant radiating dyke swarms on Earth and Venus, Earth Science Reviews, 39, 1-58. Fassett, C. I., J. W. Head, D. T. Blewett, C. R. Chapman, J. L. Dickson, S. L. Murchie, S. C. Solomon, and T. R. Watters (2009) Caloris impact basin: Exterior geomorphology, stratigraphy, morphometry, radial sculpture, and smooth plains deposits, Earth Planet. Sci. Lett., 285, 297-308, doi: 10.1016/j.epsl.2009.05.022. Head, J. W. and L. Wilson (1986) Volcanic processes and landforms on Venus: Theory, predictions, and observations, Journal of Geophysical Research, 91, 9407-9446. Head, J.W. 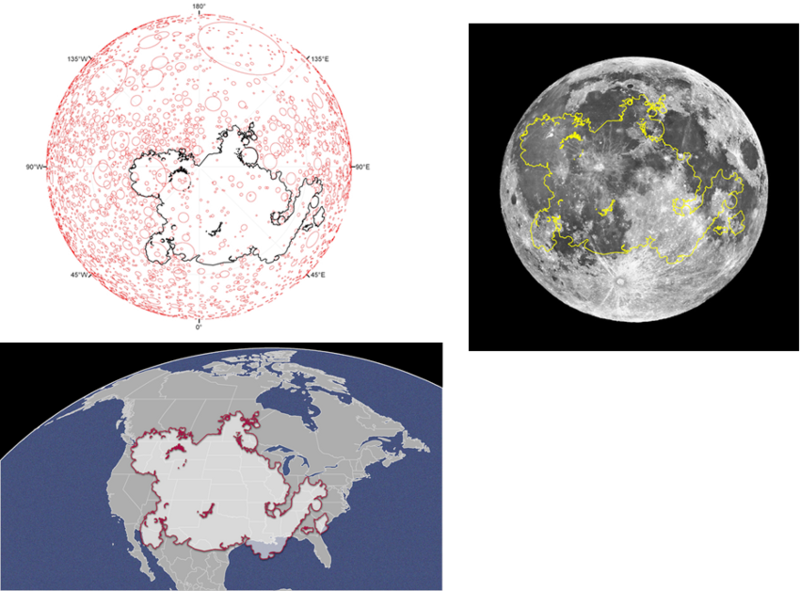 and L. Wilson (1992a) Lunar mare volcanism: Stratigraphy, eruption conditions, and the evolution of secondary crusts, Geochimica et Cosmochimica Acta, 55, 2155-2175, 1992a. Head, J.W. and L. Wilson (1992b) Magma reservoirs and neutral buoyancy zones on Venus: Implications for the formation and evolution of volcanic landforms, Journal of Geophysical Research, 97, 3877-3903. Head, J.W. and L. Wilson (1991) Absence of large shield volcanoes and calderas on the Moon: Consequence of magma transport phenomena?, Geophysical Research Letters, 18, 2121-2124. Head, J. W., L. Wilson, M. Robinson, H. Hiesinger, C. Weitz, and A. Yingst (2000) Moon and Mercury: Volcanism in early planetary history, in Environmental Effects on Volcanic Eruptions: From Deep Oceans to Deep Space, edited by T. K. P. Gregg and J. R. Zimbelman, pp. 143-178, Plenum, New York. Head, J. W., L. Wilson, J. L. Dickson, G. Neukum, and the HRSC Co-Investigator Team (2006) The Huygens-Hellas giant dike system on Mars: Implications for Late Noachian-Early Hesperian volcanic resurfacing and climatic evolution, Geology, 34, 285-288, doi: 10.1130/G22163.1. Head, J. W., C. R. Chapman, D. L. Domingue, S. E. Hawkins III, W. E. McClintock, S. L. Murchie, L. M. Prockter, M. S. Robinson, R. G. Strom, and T. R. Watters (2007) The geology of Mercury: The view prior to MESSENGER mission, Space Sci. Rev., 131, 41-84, doi: 10.1007/s11214-007-9263-6. Head, J. W., S. L. Murchie, L. M. Prockter, M. S. Robinson, S. C. Solomon, R. G. Strom, C. R. Chapman, T. R. Watters, W. E. McClintock, D. T. Blewett, and J. J. Gillis-Davis (2008) Volcanism on Mercury: Evidence from the first MESSENGER flyby, Science, 321, 69-72, doi: 10.1126/science.1159256. Head, J. W., S. L. Murchie, L. M. Prockter, S. C. Solomon, C. R. Chapman, R. G. Strom, T. R. Watters, D. T. Blewett, J. J. Gillis-Davis, C. I. Fassett, J. L. Dickson, G. A. Morgan, and L. Kerber (2009a) Volcanism on Mercury: Evidence from the first MESSENGER flyby for extrusive and explosive activity and the volcanic origin of plains, Earth Planet. Sci. Lett., 285, 227-242, doi: 10.1016/j.epsl.2009.03.007. Head, J. W., S. L. Murchie, L. M. Prockter, S. C. Solomon, R. G. Strom, C. R. Chapman, T. R. Watters, D. T. Blewett, J. J. Gillis-Davis, C. I. Fassett, J. L. Dickson, D. M. Hurwitz, and L. R. Ostrach (2009b) Evidence for intrusive activity on Mercury from the first MESSENGER flyby, Earth Planet. Sci. Lett., 285, 251-262, doi: 10.1016/j.epsl.2009.03.008. Head, J. W., C. R. Chapman, R. G. Strom, C. I. Fassett, B. W. Denevi, D. T. Blewett, C. M. Ernst, T. R. Watters, S. C. Solomon, S. L. Murchie, L. M. Prockter, N. L. Chabot, J. J. Gillis-Davis, J. L. Whitten, T. A. Goudge, D. M. H. Baker, D. M. Hurwitz, L. R. Ostrach, Z. Xiao, W. J. Merline, L. Kerber, J. L. Dickson, J. Oberst, P. K. Byrne, C. Klimczak, and L. R. Nittler (2011) Flood volcanism in the northern high latitudes of Mercury revealed by MESSENGER, Science, 333, 1853-1856, doi: 10.1126/science.1211997. Kerber, L. A., J. W. Head, S. C. Solomon, S. L. Murchie, D. T. Blewett, and L. Wilson (2009) Explosive volcanic eruptions on Mercury: Eruption conditions, magma volatile content, and implications for mantle volatile abundances, Earth Planet. Sci. Lett., 285, 263-271, doi: 10.1016/j.epsl.2009.04.037. Kerber, L., J. W. Head III, D. T. Blewett, S. C. Solomon, L. Wilson, S. L. Murchie, M. S. Robinson, B. W. Denevi, and D. L. Domingue (2011) The global distribution of pyroclastic deposits on Mercury: The view from MESSENGER flybys 1-3, Planet. Space Sci., 59, 1895-1909, doi: 10.1016/j.pss.2011.03.020. Michel, N. C. , S. A. Hauck, II, S. C. Solomon,, R. J. Phillips, J. H. Roberts, M. T. Zuber (2012) LPS 43, Abstract #1671. Milkovich, S. M., J. W. Head III, and L. Wilson (2002) Identification of mercurian volcanism: Resolution effects and implications for MESSENGER, Meteoritics & Planetary Science, 37, 1209-1222. Murchie, S. L., T. R. Watters, M. S. Robinson, J. W. Head, R. G. Strom, C. R. Chapman, S. C. Solomon, W. E. McClintock, L. M. Prockter, D. L. Domingue, and D. T. Blewett (2008) Geology of the Caloris basin, Mercury: A view MESSENGER, Science, 321, 73-76, doi: 10.1126/science.1159261. Nittler L. R., Starr R. D., Weider S. Z., McCoy T. J., Boynton W. V., Ebel D. S., Ernst C. M., Evans L. G., Goldsten J. O., Hamara D. K., Lawrence D. J., McNutt R. L., Schlemm C. E., Solomon S. C., and Sprague A. L. (2011) The major-element composition of Mercury's surface from MESSENGER X-ray spectrometry. Science, 333, 1847-1850. Parfitt, E.A., L. Wilson and J.W. Head (1993) Basaltic magma reservoirs: Factors controlling their rupture characteristics and evolution, Journal of Volcanology and Geothermal Research, 55, 1-14. Robinson, M. S., S. L. Murchie, D. T. Blewett, D. L. Domingue, S. E. Hawkins III, J. W. Head, G. M. Holsclaw, W. E. McClintock, T. J. McCoy, R. L. McNutt Jr., L. M. Prockter, S. C. Solomon, and T. R. Watters (2008) Reflectance and color variations on Mercury: Regolith processes and compositional heterogeneity, Science, 321, 66-69, doi: 10.1126/science.1160080. Smith, D. E., M. T. Zuber, R. J. Phillips, S. C. Solomon, S. A. Hauck II, F. G. Lemoine, E. Mazarico, G. A. Neumann, S. J. Peale, J-L. Margot, C. L. Johnson, M. H. Torrence, M. E. Perry, D. D. Rowlands, S. Goossens, J. W. Head, A. H. Taylor (2012) Gravity Field and Internal Structure of Mercury from MESSENGER, Science DOI: 10.1126/science.1218809. Strom, R. G. N.J. Trask, J.E. Guest (1975) Tectonism and volcanism on Mercury, Journal of Geophysical Research, 80, 2478-2507. Strom, R. G., C. R. Chapman, W. J. Merline, and J. W. Head (2008) Mercury cratering record viewed from MESSENGER's first flyby, Science, 321, 79-81, doi: 10.1126/science.1159317. Strom, R. G., M. E. Banks, C. R. Chapman, C. I. Fassett, J. A. Forde, J. W. Head III, W. J. Merline, L. M. Prockter, and S. C. Solomon (2011) Mercury crater statistics from MESSENGER flybys: Implications for the stratigraphy and resurfacing history, Planet. Space Sci., 59, 1960-1967, doi:10.1016/j.pss.2011.03.018. Watters, T. R., S. L. Murchie, M. S. Robinson, S. C. Solomon, B. W. Denevi, S. L. André, and J. W. Head (2009) Emplacement and tectonic deformation of smooth plains in the Caloris basin, Mercury, Earth Planet. Sci. Lett., 285, 309-319, doi: 10.1016/j.epsl.2009.03.040. L. Wilson (2009) Volcanism in the Solar System, Nat. Geosci., 2, 389-397. Wilson, L. and J. W. Head (1983) A comparison of volcanic eruption processes on Earth, Moon, Mars, Io, and Venus, Nature, 302, 663-669. Wilson, L. and J.W. Head (1994) Mars: Review and analysis of volcanic eruption theory and relationships to observed landforms, Reviews of Geophysics, 32, 221-263. Wilson, L., and J. W. Head (2002) Tharsis-radial graben systems as the surface manifestation of plume-related dike intrusion complexes: Models and implications, J. Geophys. Res., 107 (E8), doi: 10.1029/2001JE001593. Wilson, L., and J. W. Head (2008) Volcanism on Mercury: A new model for the history of magma ascent and eruption, Geophys. Res. Lett., 35, L23205, doi: 10.1029/2008GL035860. Wilson, L. and J. W. Head (2012) Volcanic eruption processes on Mercury, LPS 43, Abstract #1316. Wilson, L., J.W. Head III and E.A. Parfitt (1992) The relationship between the height of a volcano and the depth to its magma source zone: A critical reexamination, Geophysical Research Letters, 19, 1395-1398.